An evening pause: A very talented actor once told me that a great deal of all comedy is based on contrast, on juxtaposing extreme opposites in unexpected ways. The NASA administrator, Charles Bolden, has balked at the Europe-China negotiations for docking a Chinese manned craft at ISS. I don’t know what Bolden can do about this, however, as we don’t have the ability to get to our own space station, while Europe and the Chinese do. The science leaders on the team that announced faster-than-light neutrinos at CERN last year have stepped down. An evening pause: The central sequence from the 1979 movie, The Black Stallion, when the shipwrecked boy Alec succeeds in taming the shipwrecked Arabian horse. The combination of Carmine Coppola’s music and Caleb Deschanel’s photography in this sequence is unmatched. The Buzz Lightyear toy that flew on space shuttle has been donated to the Smithsonian. This news item illustrates the sad state of the American space program, when the arrival at a museum of a foot-high plastic toy that had been in space merits major news coverage. Worse, if we instead wanted to bring this toy back to ISS, we can’t, at least not without begging help from someone else. The report of an 80-year-old former U.S. Marine has provided the Chinese a clue to the whereabouts of the missing bones of Peking Man. Life imitates pulp fiction: A report describing the memories of an 80-year-old former U.S. Marine has provided the Chinese a clue to the whereabouts of the missing bones of Peking Man. More details unveiled describing the charges against the CERN scientist on trial in France. More details revealed describing the charges against the CERN scientist on trial in France for consorting with al-Qaeda. So, if these emails are accurate, this guy did far more than simply correspond with terrorists. He plotted to aid them in terrorists attacks. Want to see where the wind is blowing? 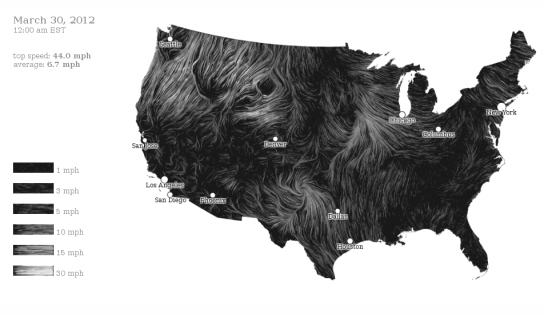 Check out this website, which shows an animated map of the wind patterns blowing across the continental United States, continually updated. Geologists have uncovered a variable in the amount of uranium in rocks that will as increase the margin of error for dating events hundreds of millions of years ago. The uncertainty of science: Geologists have uncovered a variable in the amount of uranium in rocks that will increase the margin of error for dating events hundreds of millions of years ago. An evening pause: The beauty of a flower from a scientist’s perspective. Enceladus’s gushing geysers, as seen by Cassini. The French trial of a CERN physicist for associating with terrorists began today. As much as I fear and oppose the intolerant Islamic world, I worry when we in the West beginning putting people on trial merely for talking to the wrong people. I wish the accusations against this man weren’t so vague. The House today passed the Republican 2013 budget, 228-191. Ten Republicans voted no. All Democrats voted no. Though this budget might not be perfect, at least it makes an effort to face the budget situation. Note also that the Democrats have now rejected their own President’s budget as well as the Republican budget. In addition, the Democratic leadership in the Democratically-controlled Senate has already said they won’t pass a budget this year, the fourth year in a row. The country is sinking in debt caused by the federal government. It behooves these elected officials to deal with it. That the Democrats won’t tells us much about their lack of qualifications for office. The House today rejected Obama’s proposed budget 414 to 0. The House today rejected Obama’s proposed budget for 2013 by a vote of 414 to 0. We must all remember this vote when the Democrats demonize any future budget proposals by the Republicans. The above vote was very bipartisan. Even the Democrats rejected Obama’s proposal. A solar tornado five times the size of the Earth. The Russians are building nuclear powered engines for long range space travel, and announced today that they expect to have the first engine ready by 2017. Europe’s ATV freighter has successfully docked with ISS. An expedition financed by Jeff Bezos, the founder of amazon.com, has found the rocket engines of the Apollo 11 Saturn 5 rocket. An expedition financed by Jeff Bezos, the founder of amazon.com, has found the rocket engines of the Apollo 11 Saturn 5 rocket at the bottom of the Atlantic. An incandescent light bulb, stored in a time capsule for one hundred years, still worked! I wonder: Did the EPA try to arrest anyone for using it? Based on discoveries already made, astronomers now estimate there are probably more than a hundred habitable superEarths within 30 light years of the Sun. Ringed clouds at the edge of space. Man-made ringed clouds at the edge of space. Lunar Reconnaissance Orbiter recently celebrated its 1000th day of imaging in orbit around the Moon, snapping images and cataloging the Moon’s geology. Only a week before the science team posted a spectacular oblique view of Ryder Crater. The image is visible below the fold, along with a close-up of the crater’s strange hump-backed boulder-strewn floor. An evening pause: News you can use!